Oh, shoot me. This Panerai Forum is something I set-up with the help of some Panerai enthusiasts. The Dutch Rolex Forum is quite popular, so I wondered if there would be space for a Dutch Panerai Forum as well. 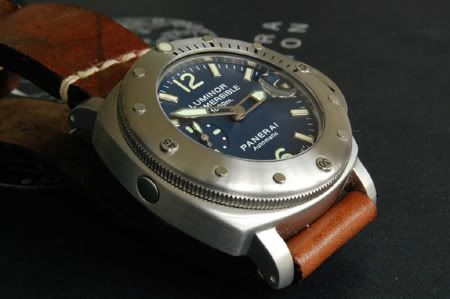 Panerai is a brand that I have the famous love – hate relationship with. I had this wonderful PAM 113 and sold it because I thought I could do without. Boy, I was wrong. I really missed the whole Panerai experience.. being a Paneristi, buying and changing Panerai straps once in a while (or too often). So, about a year after I sold it, I ran into this great looking Panerai 000. As good as new. And the enthusiasm was immediately there again. Anyway, as a result, I started the Dutch Panerai Forum. For Flemish and Dutch writing/reading Panerai enthusiasts. So if you are one of those, click and take a look at the forum! Photo by Gertjan, visitor of the paneraiforum.nl site.